Home Off Beat	USB Thumb – Thumbs up for this one! 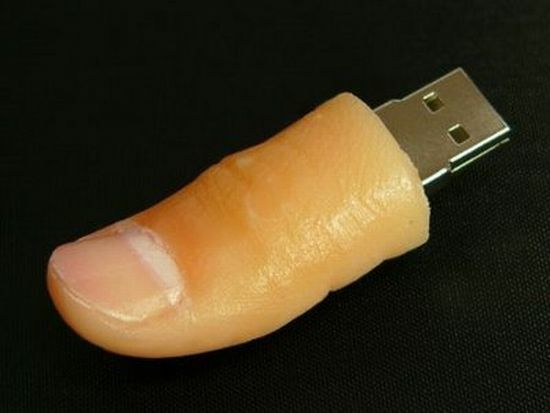 USB Thumb – Thumbs up for this one! This USB is suitable only for people with strong hearts or for people with a rare kind of sense of humour! Not many can enjoy the fact that their USB drive looks like a human thumb and who can comfortably strut around with this crazy piece of technology sitting in their pockets or worse, worn around their necks! There is barely anything that science hasn’t created, human corneas to kidneys, everything can now be artifically created looks like technology is also amused by such phantom research in biology and is taking a leaf out of its book, or should I say, a thumb?